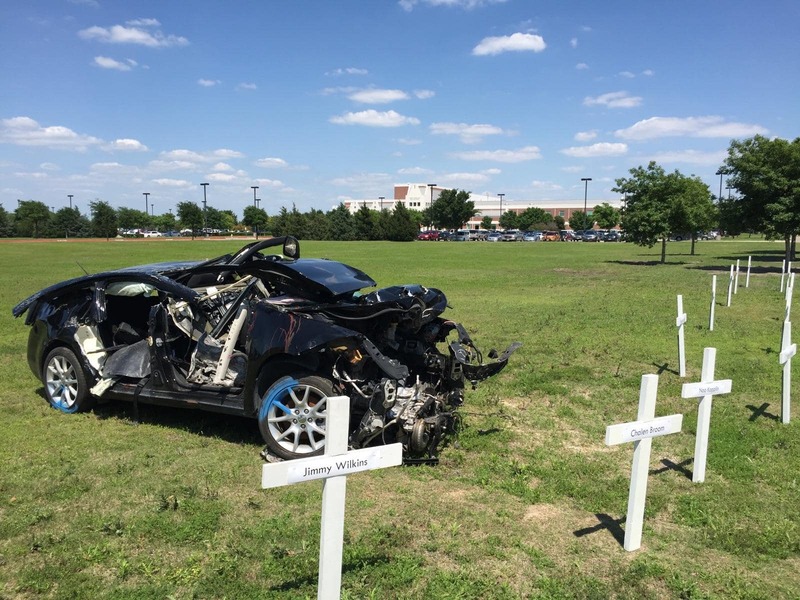 The words of Katelin Beyer, a former Frisco ISD student who experienced a life-altering car accident four years ago. She and her friends made one decision that changed her life forever. Now, she shares her story as part of the Shattered Dreams program, an effort to educate students about the dangers of underage drinking and the severe consequences that can result from impaired or distracted driving. 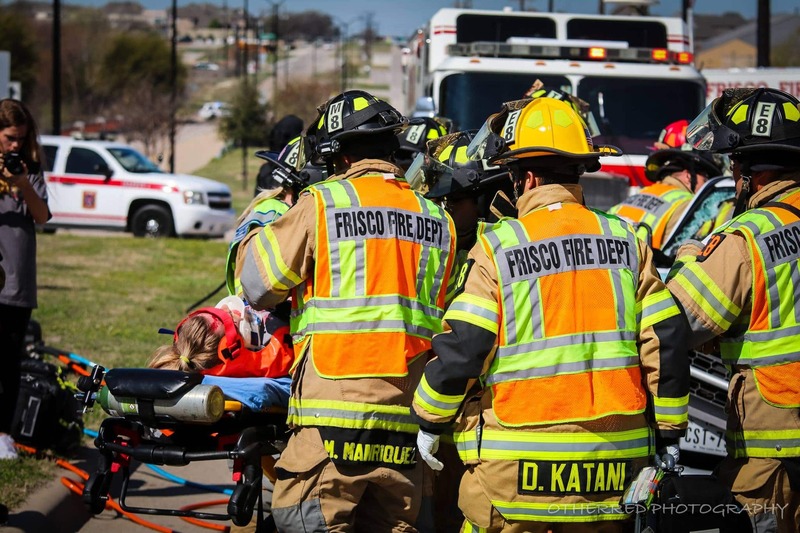 Every year at this time, the Frisco Police Department, in conjunction with the Frisco Fire Department and Frisco ISD, host the Shattered Dreams program on the campus/es of a Frisco ISD high school. The two-day program is designed to educate students about the dangers of underage drinking and the severe consequences that can result from impaired driving. 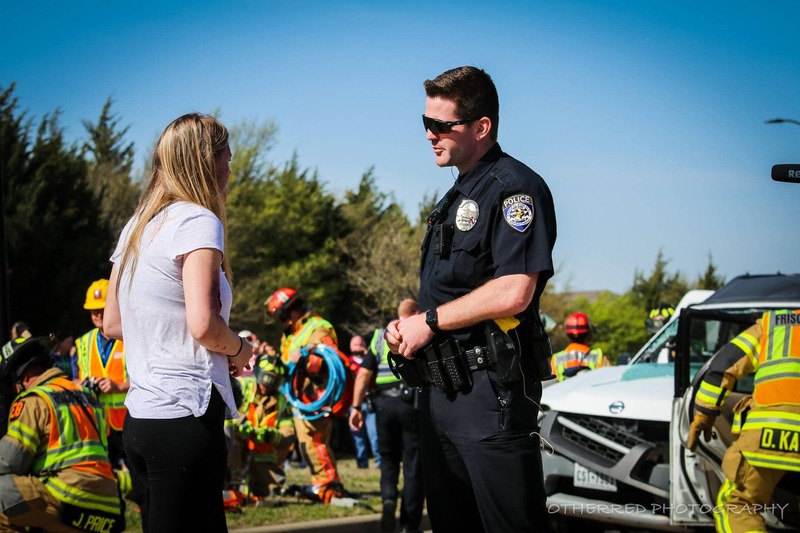 The annual program is coordinated by the Frisco Police Department’s School Resource Officer Unit and rotates through different high schools in Frisco each year. It involves the elaborate dramatization of an alcohol-related car accident staged in front of the school. While the entire student body watches, police, fire, and other emergency personnel respond to the scene. Day one. The entire student body gathers in the school Auditorium where they watch a video produced by the Broadcasting students. It’s a fictitious party scene, which ends with teenagers making a decision to get into vehicles under the influence of alcohol. There are police officers present. A tone comes out from dispatch stating that there’s an accident that has just happened outside. The cops’ motorcycles fire up and they ride out like they’re responding. The entire student body is escorted outside, where they witness the aftermath of the accident. Earlier that morning while the students were in class, LW Towing brought two wrecked cars to the street in front of the school, and with the help of Frisco PD, Fire and Rescue, and theater students, the vehicles and “victims” are made to look like a real accident has just taken place. Shattered windshields, blown airbags, blood. It looks incredibly real. Student actors, transformed to look as though they’ve been seriously injured, are strategically placed in the wreckage. Standing in front of the wreckage is the one who caused the accident, her drunken mind trying to figure out what she’s done. The “victim” students (student actors who have volunteered and applied to be a part of the program) are transported by ambulance and CareFlite to Centennial Medical Center, while the “deceased” student is transported by Turrentine Jackson & Morrow Funeral Home. The “drunk driver” is arrested and transported to the Frisco City Jail for book-in and arraignment. It’s all captured on video. In addition to watching the aftermath of the accident, throughout the school day, a Grim Reaper enters a classroom every 15 minutes and selects a student victim, known as the “Living Dead.” Their obituaries are posted in the hallway. At the end of the school day, the Living Dead, the crash victims, and the drunk driver are taken on an overnight lock-in to enhance the learning experience. First, these select students participate in group activities and it’s just a fun time to cut-loose following the intense day. The light-heartedness wanes as the students sit and listen to speakers, like Katelin Beyer, whose lives have been impacted by drunk driving. Finally, the students are asked to write a letter to their parents, from the point of view that they died as a result of their choice to drink and drive. The next morning, the students return to school where they attend a mock Memorial service in the Auditorium with the rest of the student body. They listen in horror as Dr. Mark Gamber, the EMS Medical Director for Frisco Fire Rescue takes the stage and breaks down, in gruesome detail, what happens when the paramedics find you in a car accident. He pulls NO punches. Everyone watches intently when the video footage from the jail and hospital is presented. No one has seen this part yet. They watch as doctors and nurses scramble to stabilize their peers. They watch as a mother is informed her child didn’t survive, she bursts into tears, and then leans over to give her daughter a kiss goodbye. The arrestee has her mugshot taken, fingerprints scanned and the cell door slams shut. To view the entire 2018 Liberty High School Shattered Dreams video production, click here. 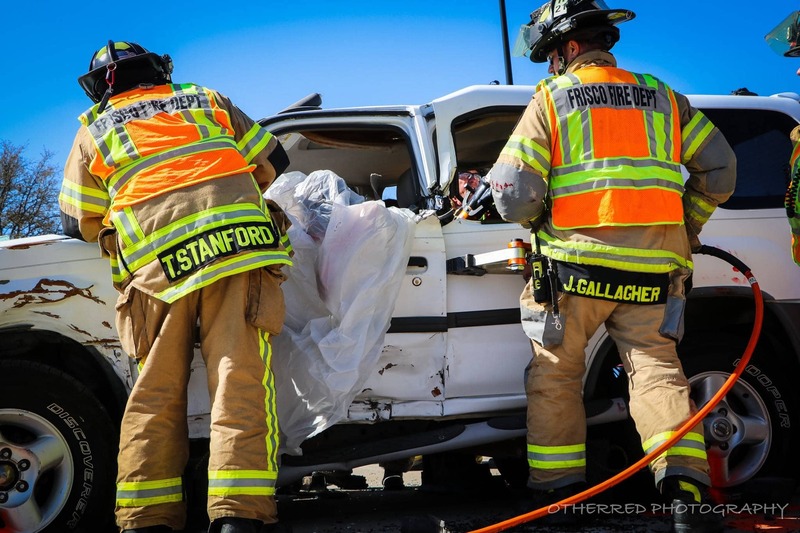 Click here for a photo album of the 2018 Liberty High School Shattered Dreams program car accident dramatization, courtesy of OtherRed Photography. Caution: Although entirely fabricated, the images are graphic and could be upsetting to some viewers. The intense two-day program is designed to educate students, parents, and the community about the serious issue of underage drinking and driving. This effort to educate and empower our kids is not just the Police Department’s job or the school’s job to do, it’s the parents’ job also. We always need to be talking about it and raising awareness about how one bad decision you make can affect the rest of your life and…shatter your dreams. Wakeland High School Shattered Dreams program. Photo courtesy of Officer Doug Brown, Frisco Police Department. 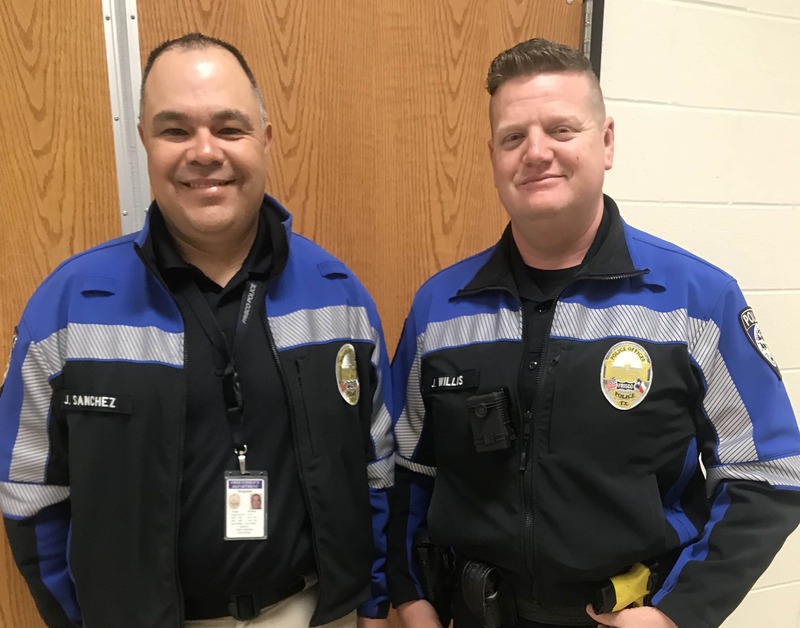 Frisco Police Officer Doug Brown is a Student Resource Officer at Wakeland High School and, among other SRO’s in Frisco, has been instrumental in streamlining the program for Frisco ISD. It’s an ongoing process. We get feedback after every program and improve it from year-to-year. I suggested to Officer Brown that, having witnessed the 2018 Liberty HS event, I think Frisco’s extraordinary program must be one of the best in the country. Officer Brown does feel proud of the commitment and collaboration of everyone involved. We do go over the top with it… If Little Elm, Prosper, anyone calls me and says ‘we want to know what you guys are doing in Frisco,’ we’re more than happy to help them. For us, the main goal is…if we can just affect one. It’s a lot to put out there. Some take it seriously, some don’t. But I think it’s worth it if one kid will make the right choice. Katelin Beyer bravely shares her personal story each year for Shattered Dreams. She was once a student at Centennial High School and continues to reside in Frisco. 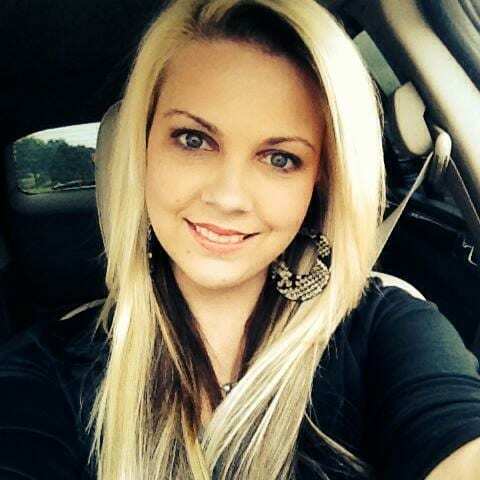 She was 21 at that time of her alcohol and texting-related accident; her life changed in an instant. I was partying with 5 friends and I had too much to drink. And for some stupid reason, I decided to get into the truck with them. I was in the back seat, the middle, buckled up. We had decided to make a liquor run. We were heading to the store and he was speeding a little bit. He received a text message from his mom, looked down and started to answer it. Someone in the car hit him and said ‘watch out!’ He looked up and saw that he was going over the double yellow line, freaked out, overcorrected, and hit a culvert in the road. The vehicle flipped 3 or 4 times. My seatbelt failed. I was ejected out of the back window. The whole right side of my head was shattered and scalped. She was in a coma for 10 days. She has undergone 28 surgeries, complications and setbacks. She’s finally, after four years, beginning to stand with support and take steps independently. She doesn’t have the luxury of resting from her therapy for even one day, or her progress will severely regress. Katelin is rebuilding her life and beginning to make friends again, her former friends all having moved on with their lives and futures without her. While Katelin’s new reality is vastly different than before her accident, “I’m still me,” she says. Katelin’s personality is that of a typical 25-year-old young woman. Her celebrity crush is Gerard Butler. (She digs his accent.) She wishes she could do her own hair and at the time of our interview was wearing trendy, distressed jeans, just like any other twenty-something woman might prefer. 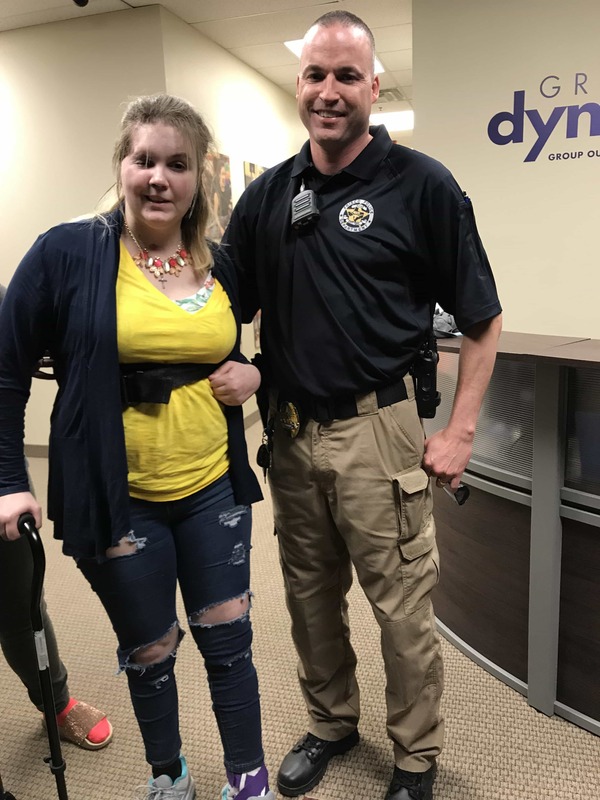 Katelin’s social security benefits are no match for the surgeries, therapies, and homecare that she requires, and she wishes she could do something to earn money. In the immediate present, there aren’t many options, but she feels called to become a motivational speaker someday. She got it before the accident, but it means more to her now than ever before. I wouldn’t wish this upon anyone. This is real. It can and will happen. Don’t think that you’re an exception. Thank you to the Frisco Police Officers who supported this article; in particular, Sergeant Jorge Sanchez and Officer Doug Brown for their time.